It’s cold out there! At 9am temps in the mid-upper 20s across all of the metro area except those spots exposed to the “milder” east wind coming out of the Gorge. The east wind will gradually die back this evening, but I don’t see any mixing south wind (if any) until after the rain begins. So no one below 1,000′ (most of us) will see a dramatic warming today. As mentioned last night, if rain was arriving right now, or earlier, we would have a widespread freezing rain event west of the Cascades…it’s all about timing. So where is the rain? Save this link to radar to watch it during the day. You generally want a “green” area to get rain all the way to the ground. Those are echoes above 20dbz. It’s trying to move onto the central Oregon coast at this hour. All coastal sites have jumped well above freezing, so no freezing rain out there today. Both show no (other than a sprinkle) rain arrival in the valleys until after the noon hour. They DO still hint that some of those isolated valley locations in the Coast Range could see freezing rain (Vernonia, Manning, etc…) to start. But with the forecast later arrival of rain, that decreases further the chance that we see anything frozen on roads here in Portland. I did notice one more thing on morning models/maps. This system is so weak, there is a possibility we don’t get ANY mild mixing wind today either in the Valley or the Columbia River Gorge. I think it’ll just be in isolated spots. So high temps may only be around 35 and we just sit there tonight (assuming solid cloud cover). And in the Gorge there is plenty of dry air left to allow some evaporational cooling as the precip starts. Could still be icy out there late this afternoon or evening when the rain moves in. The layer of cold air over us west of the Cascades is incredibly thin. 32 degree and warmer temps are only around 700-800′ up! By the time you get up to 2,000′ it was 46 degrees over Salem! Now that is a good inversion. This entry was posted on Thursday, December 12th, 2013 at 9:15 am and is filed under Weather. You can follow any responses to this entry through the RSS 2.0 feed. Both comments and pings are currently closed. I say to hell with this E PAC ridge. Yay, we had our cold wave. But come on folks, look at the collective damage done by this sustained anomaly which dates back to early fall. Little snow in the mountains, skiiers (including myself) bummed, ski areas closed, possible water issues next summer if this continues, etc etc. What I wish for Christmas is good old fashioned cold Gulf Alaska trough, boatloads snow in mountains, some active frontal passages, ie cool moist PNW weather. I take a long cool wet winter/spring over this crap. I’m with you PeterB. This has certainly been interesting weather but that ridge can’t go away soon enough. Believe it or not but it’s actually snowing lightly in woodland…..??? Upper layers must have cooled enough with evaporatinal cooling from the virga!!!! steady light rain in Astoria, but we’ll above 40 degrees–feels downright balmy! Radar showing some precip right over I-5 between woodburn and Salem. Below freezing. Any Fz rain reports? Virga. Just hit 32 and a slight southerly wind beginning. Eugene is above freezing. Hill areas around here are above freezing. 29 in Aloha. Not warming up real fast. Was the bulk of the moisture supposed to be this far north? If it had come in more south, it would be a mess right now, at least south of Tigard and west of PDX. It’s well below freezing there while PDX is up around 34/35. C’mon precip, get here already! I am in Dallas and we are getting this very light snow…I do not know all the differences in precipitation but it is definitely not ice pellets. It is tiny flakes or kind of like flying frost I guess. At first I thought it was just the trees losing their frost but it is everywhere. The radar is showing precip over us right now. I have friends coming in from Banks area for lunch and Christmas shopping this afternoon. I called it off just now as a precaution. I don’t think that where I live in Beaverton there will be a prolonged freezing rain event, but them getting back home, they might be at a higher risk. Temp here still hovering 26-27 wind calm at 10:30. Still about 24 out just past Banks, only they have a very light east wind as well. I’d hate to have them get stuck on the side of 26 on their way home. Man we would have a mess right now if it was raining. Will the 2-3 hours be enough?? …up to 31.1 here at vernonia international..
@ Larry, man the elevation effect. Sizzling at 620′, freezing @ 220′ level. Still hanging tough in the 20’s from my house out to F.G.Gonna be interesting afternoon…lol I love the Vernonia International ref…I forgot they have flights to Bangkok Brazil and Brussels from that airport now. Last Thursday when it looked like it was actually going to snow, it was fun! Friday was a snow day! Then Sat and Sun….Mon, Tues, Wed…..Thursday. Kids are all sledded out. No school for a week. Moms and Dads are tired of it. Snow is so dry you can’t make a snow ball or a snow man. Only the main streets are snow free. Garbage collection ceased in my neighborhood a week ago. Thus lots of garbage cans still at the curbside since last Thursday night. But at least it’s frozen so it doesn’t stink. Broken pipes in schools, businesses, homes…. Plumbers and body shops are booming! I’m pretty much ready for some plain ol’ rain! And since I’ve been unable to work (I’m in construction don’t ya know), the paycheck is gonna be a bit skinny at the end of this month. Well good for you! PDX got nothing, so we want it! Rob, where are you? We need a long range prognostication. Query: 10:13 and 25 degrees in Aloha/Hillsboro with moisture rolling in very soon. Any thoughts on afternoon ice? Mark says no, but I find it very hard to believe we warm up 6-7 degrees in the next couple hours with no south wind. Just watch the temps closely! Unless temps shoot up in the next hour (clouds are already filling in over the area), I see a flaw in the forecast for the western side of the metro area. The first radar signatures are just kicking in near Forest Grove. I believe the farther west ie towards Forest Grove, Banks, the better the chance for freezing rain you’ll get. That being said, I believe Mark covered the fact their will be no moderation NO SOUTH wind componet is huge in these events. We may stay just around freezing all day today W/O a south wind. While if you were just a couple hundred feet higher, the temps are well above freezing. Some pink on the radar just east of McMinnville. Still 27 and foggy there. up to 33 @ 10:45 in Vernonia. Just outside checking temp with handheld Kestrel therm…25.2 just near Intel. The new 12z GEM is brings a snowstorm to the region starting sometime next Friday through the weekend. It is COLD. The new 12z GEM spins up a surface low and makes the perfect track as it makes landfall at the Central Oregon coast and goes straight east. This pulls cold gorge east winds. Huge snowstorm if this verifies, tons of moisture. That sure does look juicy! Cold enough though? It’s only 8 days out, so that’s better than 10+ days out. Any thoughts, Mark? Or are you still tracking today’s temps closely? This setup would probably be marginal, because the storm is coming in from the NW, it looks like a 2008 setup with the triple point needing to stay W and E of Portland…problem is, even if there is an east wind blowing…there may not be cold enough in the basin…this is 192 hours out and will not verify. Either way it still looks transitory in nature with cold air coming in behind then heights building rapidly as the HPressure moves in over the PNW. It will be cold enough for snow because it would be offshore flow pulling in the cold gorge winds. Then after it snows the snow will remain on the ground and not melt because even colder air arrives. Kenny, just because there’s gorge winds, doesn’t mean it will be cold enough. You have to have some cold built up in the basin and that may not be the case that point. Initially it is not an offshore flow because the low is coming in from the NW, on top of that, if a triple points shows up and is N of Ptown then you are out of luck as well. At first glance, a low coming in south of Portland is great but there has to be other ingredients as well to get a snowstorm. 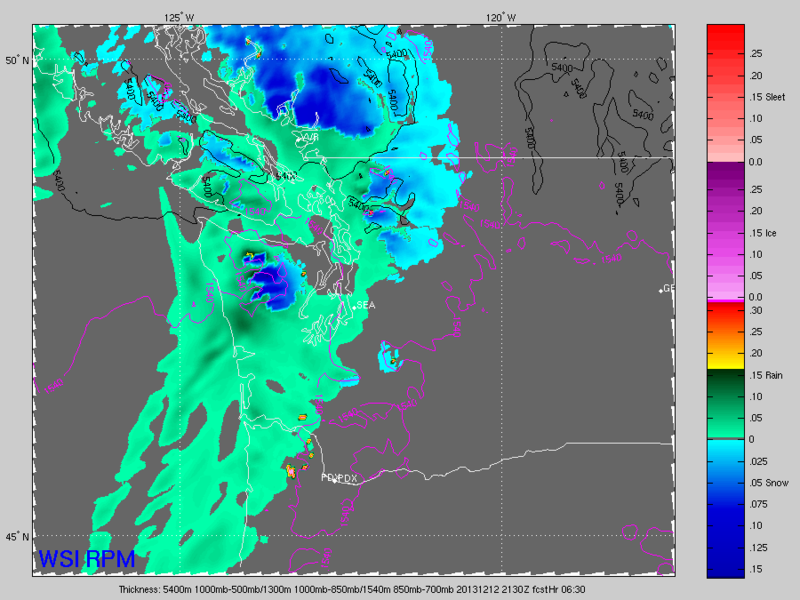 If you follow the progression, there is a low that comes in ahead of that one, north of portland, that would scour out a lot of cold basin air…2mT on that model shows no snow for portland with the initial arrival of that low, maybe after it passes through and showers arrive, then you would be looking at some snow showers but at face value, that does not show a snowstorm for PDX. If you were thinking wetbulb…that wouldn’t be the case here either with a saturated column of air. Not to mention its only one model and the GEM. 26 degrees in Sellwood. Think icy frost on windshields, trees and grass. Very beautiful morning. Hillsboro will be interesting. They’ll get the precip first and its still 24 there with no win. Sun will be gone there first too. I’m calling ice in Hillsboro around 1pm. Up to 28.2 now in Happy Valley. Radar shows precip near Lincoln City yet cam shows dry roads. Highway 18 in the coast range could be an issue with temps there still around 24 deg. wait! Winter hasn’t even STARTED yet!!!!! Mountain snow? Hoping for at least a few inches at Timberline for tomorrow. Only 100 days roughly till spring! Let the countdown begin……. boo! lots of winter left still!